It’s hard to imagine, given the present state of Marion, Indiana, that it was once considered a boom town after the discovery of natural gas in the 1890’s. Endless opportunity, money, and development were sure to follow with the promise of endless resources. 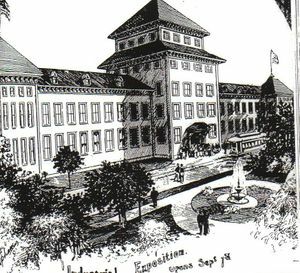 The development of East Central Indiana during the “boom” time was unprecedented and yet to be matched. Towns literally emerged from corn fields and populations of hundreds grew into thousands. But as soon as the gas supply was exhausted so were the dreams it fed. Many of those dreams belonged to George L. Mason. Mason is not given much credit in the Grant County history books--or at least not as much credit as his associates. Maybe because he was not born in Marion or maybe it has more to do with the eventual disappointment he caused the small town. 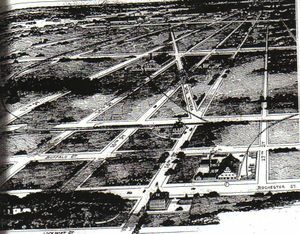 However, without George L. Mason’s inventive propreiting and visionary demonstrations Marion, Indiana would still be the tiny agricultural town it once was before the New York business man decided to make it the “Queen City” of the gas belt. Marion truly did rise out of a corn field. Before gas was found in the area, Marion was a small agricultural community of only hundreds of people (Simmons,29). In 1890, two years after natural gas was found in Marion the census showed that the population had grown one-hundred and twenty-one percent (McBrew,93). Industrialist and entrepreneurs poured into Marion, much to the thrill of locals ready to see success and wealth in their town (McBrew,92). Among these was George L. Mason the self-promoting man who credited himself with the steel boom of Birmingham, Alabama and the self-circulator of the newspaper “The Gas Age.”(Glass, 54). And though Mason would not be the only business man to seek opportunity in Marion, Indiana he overshadows all others in showmanship and eventual results. He was quick to start up his own firm: Mason and Co., more commonly referred to as Mason,Wiley, and Butler. He bought five-hundred acres of land west of the city limits, referred to as the York Addition in many books. The visionary Mason did not just want to attract business, he wanted to attract businesses that employed many people. Those people would need housing, supplies, and education that the blooming town would be all to eager to supply. And to the relief of Marion, Mason was a master of attraction. He took out ads in national papers and magazines displaying Marion as a prime opportunity for any business, promising “free gas, free land, and free water.”(McBrew,96-97). 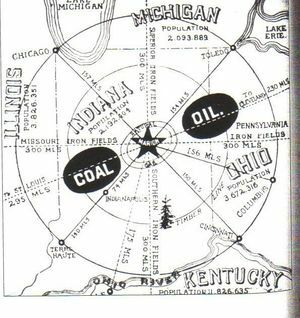 The ad displayed at left shows the strategic position of Marion, on the gas line and miles away from the coal and oil fields (Glass,54). One brochure stated that the cost of living utilities would be near twelve dollars a month because there was an almost unlimited supply of natural gas in the area. To add to that, promoters harangued that a company could save four-hundred-thousand dollars a year in utility bills and would gain fifty dollars for every employee that was employed. They also promised a strong local economy for the fostering plants and expected high population growth. But national ads were not enough for Mason; he had trains bring potential buyers from New York to Marion to see the city first-hand. These “bankers, manufacturers, merchants, and retired capitalists” were taken on a lavish show through swampy Marion, Indiana. The agenda included a tour of the city through town, through the factories, and to the newly acquired soldier’s home. Gas wells were lit for the pleasure of the buyers and to further the idea of an unlimited supply of gas. After this, more site seeing and then a banquet held in the newly built York Inn. 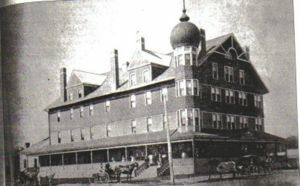 The Marion Chronicle assures the visitors that “they are welcome and hope their visit will be pleasant and profitable.”(Marion Chronicle Tribune) The York Inn was built for the aspiring purpose of housing potential investors and surrounding it were gas lamps that were fueled to run all night long. After all of Mason’s hard work he was rewarded. Lots three miles from the courthouse were sold for one-hundred to two-hundred and fifty dollars. 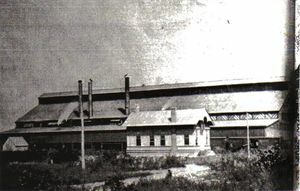 The Diamond Cracker Factory, an impressive brick building was built (but it never manufactured a single cracker) (Glass, 59). 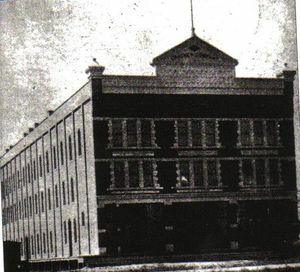 And a candy company was also built in the surrounding area. Success was short lived. Marion’s boom period only lasted five years before the “abundance” of natural gas ran dry. (McBrew,99) The plants went down and businesses were no longer interested. There were no more excursion trains, no more proprietors, and no more interested investors. Marion had had its fifteen minutes of prosperity. George L. Mason and those like him tried to quickly unload their property but were unsuccessful. (Whitson,724) Soon savings accounts emptied and Marion became an unwelcome memory to many. The Natural Gas reserve running dry was probably the last thing on George Mason’s mind on January 7, 1891, the opening day of his treasured York Inn. He held a dinner party unmatched in airs and hospitality to a group of social elite. He gave a speech that night entitled “Future of the Gas Belt” and shared plans to house a Gas Belt Exposition in Marion. (McBrew,99)(Glass,61) However, this was a failing dream whether George knew it yet or not. And though he left Marion after the gas ran out, he affected its history forever. His public relations and entrepreneurship served as an example to others in town who may have attracted longer-lasting companies and it also gave new life and meaning to a small agricultural Indiana town. In a town that we now consider a bit of an economic mess we should look back on Mason and his works with warmth and consider it a time of prosperity that molded our swampy town to its current state. Calton, Pierce. Grant County and Who's Who. Marion: The Special Company. 40-42. Glass, James A., and David Kohrman. The Gas Boom of East Central Indiana. Great Britain: Arcadia, 2005. 53-65. "Marion, Indiana 1889." Map. 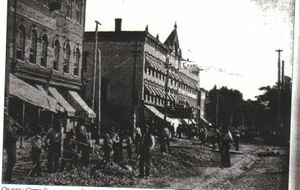 Marion, Indiana: Gray, Dobbs, and Co., 1889. McBrew, W.H. Early Episodes in Grant County Indiana. Marion: Grant County Historical Society, 1966. 90-99. "Our New York Visitors." Marion Chronicle Tribune 1 May 1890, Late ed. Simmons, Richard, Delores Caldwell, Richard Collins, Ruth Foland, Roberta George, Gabriel Graves, Suzanne Harrold, Jack Morrow, Mary Pennrod, and Mary E. Schick. A Century of Development. Marion: Grant County Historical Society, 1937. 29. Whitson, Rolland L. Centennial History of Grant County Indiana: 1812-1912. 1st ed. Vol. 1. Chicago and New York: The Lewis Company, 1914. 724-725. Whitson, Rolland L. Centennial History of Grant County Indiana: 1812-1912. 1st ed. Vol. 2. Chicago and New York: The Lewis Company, 1914. 724-725. This article was written by Allyce Mihelich and submitted on June 5, 2007 for Mr.Munn's AP US History Class at Marion High School. This page was last modified on 10 January 2008, at 14:49.